In 2012, the Indiana Commission for Higher Education (ICHE) released a plan to have 60% of working-age adults in the state hold postsecondary credentials such as an associate degree, bachelor's degree, or professional certificate. The linchpin of the project was the state's online programs due to their convenience and quick time to completion. The ICHE reached out to colleges and universities, asking them to support the initiative by offering more online programs and more distance services. Today, 34 schools throughout the state participate in the program, a testament to how the state and its schools share a commitment to online learning. 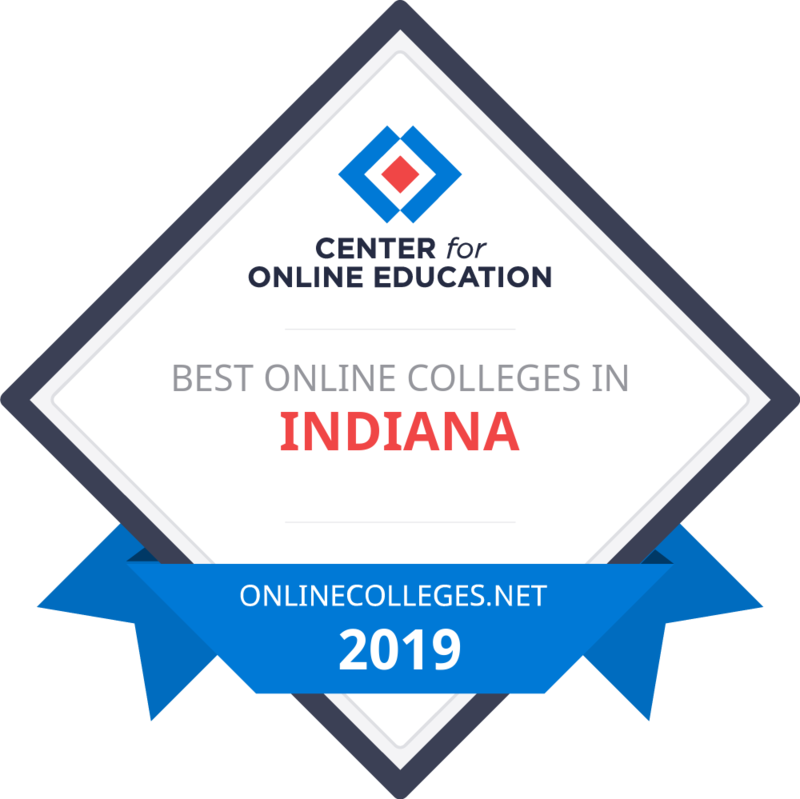 Before we look at the best online colleges in Indiana for 2018, let's consider how both higher education and online education fare in the state today. With 84 degree granting institutions, Indiana boasts the 18th highest number of colleges and universities in the country. According to the National Center for Education Statistics (NCES), Indiana hosts 16 public colleges, 40 nonprofit private schools, and 28 for-profit institutions. Additional data provided by the NCES shows that 419,203 learners enrolled in these schools during the 2016-2017 school year, down approximately 8% from attendance in 2011. As with other locations throughout the United States, tuition for both brick-and-mortar and online schools in Indiana continues to rise, yet the state remains cheaper than many other regions of the U.S. According to CollegeBoard, individuals attending public community colleges and trade schools in Indiana during 2017-2018 paid an average of $4,556 per academic year in tuition and fees, while those attending public four-year schools paid $9,361. At the state’s flagship institution, Indiana University Bloomington, in-state learners paid $10,553 in 2017-2018, while out-of-state students paid $34,845. For students attending college in Indiana, the state provides a range of need-based and non-need-based aid to help alleviate costs. According to the National Association of State Student Grant and Aid Programs, Indiana learners received a total of $323,477,035 in support during the 2015-2016 school year. Online learning continues to increase in the state, with approximately 123,000 learners — or 28.7% of all Indiana students — enrolled in at least one distance education class as of 2015. Students completing all their classes through online colleges in Indiana totaled more than 53,000, with 37,387 enrolled at the undergraduate level and 16,449 enrolled at the graduate level. According to data from the Distance Education State Almanac, approximately 63% of distance learners hail from Indiana, while 35% come from outside the state and a further 2% take courses from outside the country. Many students elect to mix campus-based and online courses. Approximately 375,550 — or 87.5% of all learners — take advantage of both learning styles. The Indiana College Network (ICN) is at the forefront of distance learning support for the state. The network consists of 35 public and private Indiana schools, all of which offer varying degrees of online courses and programs. ICN describes itself as a “match-making” service, pairing students to the many distance learning opportunities the state has to offer. In addition, the site features a host of resources introducing students to the basics of online education and tools they can use once they begin their coursework. Indiana is also one of twelve states to honor the Midwestern Higher Education Compact (MHEC). Through this Compact, students enrolled at public colleges in member states can take advantage of non-resident tuition breaks, a greater selection of courses, and a simplified transfer process. This agreement, which opens many doors for distance students in the Midwest, including many online colleges in IN. Tuition is the highest cost associated with higher education, especially for those who have their hearts set on out-of-state schools. Fortunately, numerous opportunities exist to help students access these schools without breaking the bank. Working in partnership with other states’ departments of education, the Midwestern Higher Education Compact increases access to higher education for more students, regardless of whether or not they hail from Indiana. The Midwest Student Exchange Program allows students to attend an out-of-state Midwest school at a reduced cost. As of 2018, 10 states participate in this voluntary program. Participants include Illinois, Indiana, Kansas, Michigan, Minnesota, Missouri, Nebraska, North Dakota, Ohio, and Wisconsin. Through this program, public colleges and universities charge no more than 150% of what in-state learners pay. Private schools also provide a 10% tuition reduction. Savings vary for each student, but most save $500-$5,000 annually. Because individual schools set rules about participation, students should check with their prospective institution to ensure they meet requirements. Below, you will find our rankings of the best online four-year programs in Indiana. Our profiles look at how schools approach online education and then list out their services for distance students and their popular, fully online degrees. After reviewing the best online schools in Indiana, explore our state resources, including a database of every college and university in Indiana or our index of popular in-state scholarships. At Ball State Online, students can select from nine undergraduate and 28 graduate programs. This online college in Indiana also offers multiple certificate programs, including teacher licensure for students planning to teach in Indiana. A few programs at Ball State use a hybrid format, and the university website indicates which programs include hybrid components and how they affect a students' education. All undergraduate programs include a core curriculum that culminates in a capstone experience. Ball State professors use different technologies to ensure that online students receive an education that closely mirrors what on-campus students experience. In a single course, students may use discussion boards, blogs, and file sharing to communicate and work with peers. Online students receive free software such as Microsoft Office and antivirus programs. Undergraduate applicants apply during one of four start dates. Ball State considers transfer credit on a case-by-case basis; for credit to transfer, students must possess a minimum 2.0 GPA in the course. The university does not consider credit from unaccredited schools, and applicants with GEDs may apply if they earned a minimum 520 score. Other application requirements include ACT or SAT scores and high school transcripts, even if applicants did not graduate. Applicants ages 24 and older use a modified application. At Ball State, out-of-state students pay approximately 66% more in tuition than in-state students. However, in-state students can reduce their tuition bill by taking a full course load each semester. The university works closely with veterans through its office of veterans affairs and veterans benefits. From its Marion campus, Indiana Wesleyan has nearly 90 programs that students can complete entirely online or through a hybrid program at one of the university's Indiana, Ohio, or Kentucky campuses. Academic highlights include a master's program in divinity and an extensive selection of bachelor's and master's certificate programs. The online MBA program boasts four concentrations: healthcare administration, personal financial planning, project management, and school administration. Indiana Wesleyan's online programs use an asynchronous learning model so students can plan their educations around their professional and personal lives. Although courses use traditional assessment methods such as papers and tests, university professors assess students' learning through technology-based projects, including video presentations. To ensure students' academic success, the university pairs every online student with an academic adviser and online services that include a complete digital library. The tuition for each course includes digital textbooks that students receive approximately one week before starting classes. Indiana Wesleyan does not charge an application fee and considers transfer credit on a case-by-case basis. The university uses rolling admissions and provides admission decisions within days. For credit to transfer, students must have earned a minimum C grade in the course. The university also grants credit for prior learning and professional experience. Transfer students must take all core courses at Indiana Wesleyan, and new students can begin their educations within days of receiving an admission offer. At Indiana Wesleyan, degree paths determine tuition. All online students pay credit-based tuition, and graduate students pay approximately 25% more per credit than undergraduate students. Active military personnel and veterans receive an automatic 10% tuition discount, and credits veterans earned while deployed transfer automatically. Online students at Saint Mary-of-the-Woods can select from 16 online undergraduate programs that include criminology, human services, marketing, and theology. Approximately 36% of students earn their degrees entirely online. Saint Mary-of-the-Woods is a Catholic university, and 40% of the student body identifies as Catholic, though they accept students of all faiths. Online courses, which are all accredited through the Higher Learning Commission, start at various points throughout the year. Though no online program requires students to visit campus, students can earn their degrees in a hybrid format if they choose. Online students receive valuable online resources, including advisers, tutors, and experienced peer mentors. Saint Mary-of-the-Woods does not charge an application fee and accepts either a high school diploma or GED. Other application requirements include ACT scores and a choice of essay, resume, or recommendation letter. The music theory, RN-to-BSN, and transition to teach programs ask applicants to submit additional materials. For transfer credit to apply, students must possess a minimum C grade in each course and have earned those credits at a regionally accredited institution. Saint Mary-of-the-Woods and Ivy Tech Community College partner to help students receive the maximum number of transfer credits. The university also awards credit through prior learning assessment (PLA) and the College Level Examination Program (CLEP). Both the PLA and CLEP require a fee. Besides music theory, RN-to-BSN, and transition to teach program students, online students pay the same tuition regardless of major. All active military personnel and veterans receive an automatic 50% tuition discount for undergraduate programs, but this does not extend to graduate students. Online undergraduates may qualify for a $1,000-$2,000 academic merit scholarship if they maintain a minimum 2.5 GPA, and each graduate program boasts a unique merit scholarship program. Bloomington boasts 120 online programs that include certificate, associate, bachelor's, master's, and doctoral degrees. All programs use asynchronous learning. All new students receive an in-depth orientation that introduces them to online learning. Other benefits that online students receive include math support, a digital career center, and IT support through phone or email. The Bloomington core curriculum stresses different areas depending on the major, but all students complete coursework in mathematics, science, and the humanities so they receive a well-rounded undergraduate education. Undergraduate students without transfer credit complete 120 credits, at least 18 of which apply to their majors. Students can apply at one of four start dates: fall, spring, and two separate summer dates. Each start date has a unique priority application deadline, and application requirements vary by degree level, but typically include official college or high school transcripts and standardized test scores. Tuition varies by program; out-of-state students pay 40%-300% more for their degrees compared to in-state students. Bloomington awards multiple merit-based scholarships to incoming students and those who maintain excellent grades. Besides financial assistance, the university gives all students access to valuable financial planning software and other resources. Transfer students may apply up to 64 credits toward their degrees. Bloomington requires a minimum C grade for credits to transfer; the university makes exceptions in limited circumstances. The university's credit transfer service (CTS) works with students one on one to review transcripts and award credit, and once CTS makes a transfer determination, it applies at all Indiana University campuses. All campuses also host military support offices, and the university awards grants to veterans whose 9/11 GI Bill® benefits do not cover all education-related expenses. Online undergraduate students at Indiana State select from 23 bachelor's programs that include 16 potential minors. Unique programs include adult career education, cybercriminology and security studies, and intelligence analysis. The university also offers 21 master's programs such as educational technology, occupational safety management, and special education. Prospective students can take a free quiz to determine if their learning style fits with Indiana State's online learning requirements. The Indiana State website boasts an easy-to-use guide that shows which states, territories, and Canadian provinces recognize the university's online degrees. State certification agencies heavily regulate the nursing and education fields; the Indiana State curriculum may not meet some students' state licensure or certification requirements. Applicants to this accredited online college in Indiana can apply for the fall, spring, or summer semester, and each start date has a unique application deadline. Freshman applicants must submit high school transcripts, SAT or ACT scores, and pay an application fee. Applicants over 21 do not need to submit standardized test scores. Indiana State also accepts the GED, and the admissions department does not use GED score cutoffs. Graduate application requirements vary by program, but typically include standardized test scores and recommendation letters. To receive credit, transfer students must have earned a minimum 2.0 GPA at their former accredited college or university; the Colleges of Education and Nursing require a minimum 2.5 GPA. Students attending Indiana State in Illinois, Kentucky, and Ohio qualify for reduced out-of-state tuition. Other out-of-state students pay approximately 110% more for their degrees compared to in-state online students. Undergraduate, transfer, and graduate students may qualify for Indiana State's dozens of need-based and merit scholarships. The Branch scholarship program also automatically pairs accepted students with scholarships that range from $1,000-$6,000. The university's veterans services department works with active military personnel, veterans, and their children to ensure that students receive all guaranteed Post-9/11 GI Bill® benefits. At Indiana University -- East, students can complete one of 14 bachelor's programs in areas such as applied health science, criminal justice, or informatics -- all without stepping foot on the university's Richmond campus. Graduate students can select from three graduate certificates in composition studies, early childhood education, or mathematics. All programs carry accreditation from the Higher Learning Commission. Indiana University's online bachelor's programs appeal to students who possess associate degrees, and most programs accept 30-60 transfer credits, meaning that transfer students can earn their bachelor's in just two years. Transfer students who lack specific required courses, such as core undergraduate courses, can take them at Indiana University. In 2017, the university debuted an online honors program that requires advanced coursework, extracurricular activities, and a portfolio. Prospective students may submit their application materials either online or through the mail. Indiana University charges an application fee, and those applying as freshmen must submit high school transcripts and either SAT or ACT scores. Transfer students must also submit official college or university transcripts. Before starting coursework, new students work with advisers to create an individualized academic plan. Online students receive ample resources to help them succeed with online learning including a writing center, math and science resource center, and specialized online learning software. Undergraduate in-state students save 33% on tuition compared to out-of-state students, and In-state graduate students save approximately the same amount. All online students pay a fee for each online course they attempt. Indiana University proudly works with the Yellow Ribbon Program to reduce veterans' college costs. The school awards outreach scholarships applicable to both on-campus and online students. Each scholarship requires a separate application. New students with excellent high school GPAs or high standardized test scores may automatically receive other merit-based scholarships. Southern Indiana's 11 online degrees include bachelor's, master's, and doctoral programs. The MBA program boasts concentrations in accounting, data analytics, engineering management, healthcare administration, and human resources. Students can also earn one of three certificates in addiction science, continuing education for health professionals, or lifelong learning. The bachelor's programs focus on degree completion, which makes them an excellent option for prospective students who already have an associate degree. The university's online bachelor's and master's programs in nursing possess state authorization in most states, and the website includes a guide that indicates which states recognize Southern Indiana's online programs. All online courses use an asynchronous learning format. Southern Indiana uses the Blackboard learning system to deliver course content and provides extensive IT support and educational materials to students unfamiliar with online learning. Some courses may require students to take exams and other assessments at authorized proctoring centers in their home communities. Applicants must possess a minimum 2.5 high school GPA or show satisfactory progress at their previous colleges. Applicants age 22 and under must submit SAT or ACT scores. Southern Indiana uses a transfer credit evaluation to ensure that each transfer student receives the maximum number of transfer credits. Southern Indiana's RN-to-BSN completion program charges in-state and out-of-state students identical tuition. For all other undergraduate programs, in-state students save approximately 66% on tuition compared to out-of-state students. In-state graduate students save approximately 50%. Regardless of residency, all students pay a fee for each online course they attempt, though out-of-state students pay more than in-state students. First-year students may qualify for up to $5,000 per year in merit-based aid, and transfer students may qualify for up to $2,000 per year. Neither award requires a separate application. At Bethel, students receive a Christian education while earning one of six bachelor's degrees or one of five master's degrees. This online college in Indiana also boasts two master's certificate programs in school administration and special education. Both the undergraduate and graduate programs include religious-orientated degrees in Christian leadership and ministry. Students living near the Mishawaka campus can earn a bachelor's in social science or master's in counseling degree through a hybrid program. All programs possess regional accreditation through the Higher Learning Commission. While most programs take 2-3 years to earn their degree, full-time RN-to-BSN students can earn their degrees in just one year. Courses last 7-15 weeks. Application requirements vary depending on an applicant's professional and educational experience but typically include transcripts, placement test scores, recommendation letters, and essays. Transfer students can apply credits or PLA toward their degrees. Undergraduate transfer applicants must have earned a minimum C- grade in a course for credit to apply, and graduate credit transfer requirements vary by program. Transfer students must earn at least 48 credits at Bethel to be awarded a degree. New students can start at one of six points throughout the year. A private college, Bethel charges the same tuition to in-state and out-of-state students. All undergraduate programs charge identical tuition, but graduate tuition varies by program. All new students pay an assessment fee to determine their course placements. Bethel uses a unique tool that allows prospective students to calculate how much money they might save through applying transfer credits, such as an associate degree toward a bachelor's program. Bethel does not offer merit scholarships or grants. To help students pay for their educations, the college uses a payment plan open to all students regardless of their financial histories or credit scores. Students from all over the country study online at Oakland City. The 10 online degrees include associate, bachelor's, master's, and doctoral programs. Students can complete an associate in general studies before applying their credits toward a bachelor's in Christian studies, operations management, business administration, or criminal justice. Each accelerated course lasts five weeks. Prospective students can sample Oakland City's online offerings through open enrollment courses. Oakland does not charge an application fee, and the application takes less than 10 minutes to complete. All applicants submit FAFSA results, and graduate applicants must possess at least two years of professional experience and submit three professional references. The MBA and strategic management master's program include extra application requirements. Transfer students can use a mix of credit, CLEP, and PLA to receive the most transfer credits. All undergraduate and graduate applicants receive an admission decision within 72 hours after applying. All undergraduate and graduate students at Oakland City pay the same credit-based tuition rate, except for criminal justice students, who pay approximately 25% less. Tuition for all programs includes textbooks, and online students do not pay additional fees. The college proudly participates in the Yellow Ribbon Program to provide active military personnel and veterans an affordable education. In 2014, the university became a Military Friendly School; Military Friendly Schools offer the greatest financial benefits and educational support to their military students. The university also awards grants to armed services members and veterans. As of the writing of this article, Oakland City does not offer any other university grants or scholarships to online students. Oakland City is affiliated with the General Association of General Baptists. All undergraduates take a foundational core curriculum that includes courses in New Testament literature and faith. Master's and doctoral programs do not include these faith-based academic requirements. Online education at Indiana Tech includes over two-dozen undergraduate programs and 10 graduate programs. Although the university boasts many STEM majors, students can also earn bachelor's degrees in general studies, criminal justice, or human services. Nearly all undergraduate programs require 120 semester credits. The graduate school includes an MBA program with five potential concentrations, including accounting, human resources, and marketing. All online degree programs at this Indiana university use Blackboard virtual learning software. Indiana Tech accepts the GED and TASC from undergraduate applicants without high school diplomas. Graduate school applicants must possess a minimum 2.5 undergraduate GPA, at least two years of work experience, and must also provide three recommendations and a 750-word essay. Some graduate programs have additional application requirements. New students can start their educations at one of eight points throughout the year, and nondegree seeking students may also apply. All of Indiana Tech's courses carry regional accreditation and transfer to nearly all accredited schools in the U.S. The university boasts a special relationship with the Maryland Higher Education Commission. Indiana Tech qualifies as an out-of-state online degree-granting institution where Maryland students can save money on their educations. Undergraduate and graduate tuition rates vary depending on whether students select an engineering or nonengineering major. Indiana Tech charges the same tuition to in-state and out-of-state students. Online students may qualify for one or more university merit scholarships, and all active military personnel receive an automatic scholarship. Indiana Tech also connects in-state students with exclusive scholarships. Indiana Tech currently plans to expand its online undergraduate and graduate programs. Prospective and currently enrolled students can petition for new programs through the university website. The online adult programs at Huntington use five-week courses so busy adults with families and careers can complete their educations on their own schedules. Huntington currently has one associate program, six bachelor's programs, and one certificate program. All programs use an asynchronous learning model, meaning students do not have to attend online classes at specific times. Students take only one course at a time. All courses boast a 7-to-1 student-to-teacher ratio, so all students can receive individualized attention. Huntington is a Christian university, but does not require online students to take faith-based courses as part of the core curriculum. The university affiliates with the Church of the United Brethren in Christ, an Indiana-based Protestant denomination. Applicants first submit a short form to the university admissions office. Soon after, admissions representatives contact them to discuss what applications materials should be submitted based on their educational and professional backgrounds. Huntington considers transfer credit, CLEP, and other assessments so students with professional experience can fulfill graduation requirements. Transfer students may apply up to 90 credits toward their degrees. To stay in good academic standing, bachelor's students must maintain a minimum 2.0 GPA and nursing students must maintain a minimum 2.5 GPA. Associate programs require 64 credits, and bachelor's programs require 128 credits. All online students pay the same per-credit tuition rate, but must also pay a technology fee each semester. Overall, online students save upwards of 50% on their education compared to on-campus students. Active military personnel and veterans receive an automatic tuition discount, but Huntington does not provide online students with scholarship or grant opportunities. However, the university's financial aid office works with students to explore other aid sources or set up monthly tuition payment plans. Huntington holds accreditation from the Higher Learning Commission. Out of all Indiana online college programs, only Kokomo has a bachelor's program in medical imaging, a perfect option for medical technicians who want to advance their careers. The other six bachelor's programs include applied science, applied health science, general studies, and informatics. Some programs include a hybrid option, wherein students take courses on the Kokomo campus and online. Studying online at Kokomo does not restrict students' academic interests. Students in the applied health science major can select from two concentration tracks: community health educator or health administration. Applied science majors can concentrate in management, and concentrations require approximately 18 additional credits. For some majors, qualified online students participate in Kokomo's honors program. Application requirements mirror those of other Indiana University campuses on this list: academic transcripts, application, and references. Online applicants use the same application as on-campus applicants. Kokomo does not set an expiration date for applicants' transfer credit, but requires that students earned a minimum 2.0 GPA in courses they want to transfer. The university also uses CLEP and other assessment tools to award credit to students with relevant professional or life experience. New online students can start their educations in the fall, spring, or summer semester, and each start date uses a unique application deadline. Online students who live in states that participate in the Midwest Student Exchange Program (MSEP) qualify for reduced out-of-state tuition. Other out-of-state students pay approximately 50% more in tuition than in-state students. Although online students from out of state still pay more than in-state students, they save thousands of dollars on their educations compared to out-of-state students studying on campus. The university exempts online students from paying multiple fees applicable to on-campus students, but online students pay a small online learning fee each semester. Northwest offers a blend of fully online and hybrid programs. The four hybrid programs include a bachelor's in computer information systems, philosophy, political science, and history; these programs require that students attend some courses on the Gary campus. The eight fully online programs feature associate and certificate programs in labor studies. All courses include weekly assignments and online discussions through forums and chat software. At Northwest, professors develop their online courses from scratch, and each course uses the Canvas digital learning system. New students receive ample resources, including a digital library, IT support, and supplemental instruction sessions. The Northwest website includes an online student tips section that contains detailed guides on time management, test-taking skills, communicating with professors, and assignments. The Northwest website even features an online readiness survey wherein prospective students compare their learning style to online learning requirements. Prospective students can apply for the fall, spring, or summer semester, and each semester uses a different application deadline. Transfer applicants must possess at least 12 credits; applicants with 1-11 credits submit the standard freshman application. New students can use Northwest's tuition and fee estimator to plan their expenses for the coming year. The estimator includes all fees applicable to online students. Indiana residents typically receive tuition assistance through grants and scholarships. These benefits extend to online and transfer students. Northwest encourages out-of-state students to seek outside financial aid sources. A Yellow Ribbon School, Northwest provides over $5,000 per year to eligible active military personnel and veterans who maintain good academic standing. Online students who pause their education due to military deployment do not incur fees and can resume at a later date. Vincennes represents one of the few online colleges in Indiana that stresses associate degrees and certificates. This focus makes Vincennes a perfect university for prospective students planning to earn their associate before transferring to an online or on-campus four-year college. The university also offers three online bachelor's programs, including homeland security, an RN-to-BSN program, and a technology major that includes two potential concentrations. All programs include a core curriculum. New courses begin in the spring, summer, and fall semesters. Vincennes uses Blackboard to deliver courses that last 8-16 weeks. Vincennes accepts the GED, and applicants with 12 or more college credits can apply as transfer students. Transfer students who attended another public college or university in Indiana typically receive the most transfer credits. New first-year students take an Accuplacer placement exam that assesses their competency in reading comprehension, sentence skills, and elementary algebra. Test results determine students' course placements. Just before starting courses, all new students receive an extensive guide on how to succeed at studying online. Unlike other online programs, Vincennes uses a unique virtual proctoring system wherein students take proctored exams online; students at many other colleges and universities must travel to a proctoring center to take their exams. Students also receive one-on-one online tutoring. Finally, online students have access to 16 academic databases that provide all major library and research services. Both Indiana and Illinois residents pay in-state tuition. Out-of-state students spend approximately 25% more on tuition than in-state students. All students pay more for upper division courses, which are those at the 300 level or higher. Online students also pay an additional distance education fee for each course they attempt. Active military personnel receive an automatic tuition discount. Vincennes does not currently award university scholarships or grants to incoming students. Vincennes possesses accreditation from the Higher Learning Commission. Purdue online students can select from five bachelor's degree options: applied science, general studies, business, early childhood education, and information systems. The university also boasts seven undergraduate minors that include psychology, history, and women's studies. Students not seeking a degree can complete a certificate in supervisory leadership or small business development, and both certificate programs use a hybrid learning model. Purdue's professors instruct more than 200 online and hybrid courses in the fall, spring, and summer semesters, and all online courses use Blackboard. Prospective students applying to an online program use the same application as those attending on campus. Those applying to a hybrid or certificate program submit a modified application. Purdue accepts transfer credits from all regionally accredited colleges and universities. The university's special relationship with Vincennes and Ivy Tech allows transfer students to apply their associate degrees toward a Purdue bachelor's program. Online students benefit from courses taught by Purdue faculty, many of whom also teach on-campus courses. Professors record lectures so students can view them at convenient times. However, students must still abide by assignment due dates and other deadlines. When students take proctored exams, they do so either at the Fort Wayne campus or at authorized proctoring centers in their local communities. Indiana residents save approximately 60% on their degrees compared to out-of-state students. Out-of-state students who live in MSEP states receive an automatic tuition discount, and some Ohio residents pay in-state tuition. Online and transfer students may qualify for university scholarships. Purdue hosts an expansive military student services center and provides special instruction to professors on how to work with veterans returning to civilian life. For these and other efforts, Purdue holds recognition as a gold-level Military Friendly School. Below you’ll find another listing of the top online schools in Indiana, sorted by their tuition rate. Our list of the most affordable online colleges is based on in-state yearly tuition, or annual tuition rates if a school does not differentiate between in-state and out-of-state students. Tuition rates are based on a full course load each semester or term. All colleges on the list offer at least one bachelor's degree completion program available entirely online. The online schools in IN with the lowest tuition are ranked highest, providing prospective students with a true list of the most affordable online colleges in their state. Before spending significant money on higher education, many prospective students want to know that a college degree is a sound investment. According to data provided by the Bureau of Labor Statistics (BLS), Indiana enjoys a low unemployment rate of just 3.2%, compared to the national average of 3.9%. The mean annual wage for all occupations, regardless of education attained or level of experience, sits at $43,950 in 2018. Depending on the area of work they plan to pursue and how many degrees they attain, graduates from online colleges in Indiana can expect to earn salaries far higher than this number. In Indiana, a number of industries demonstrated strong growth over the previous 12-month period. According to the BLS, these include mining and logging; trade, transportation, and utilities; financial activities; and professional and business services. While many jobs within these sectors did not previously require postsecondary education, sustained competition for roles means that candidates who possess degrees often receive more job offers. Full tuition; The Indiana Commission on Higher Education offers up to four years of tuition at an Indiana public college. Students must meet a number of requirements. $1,500; The American Advertising Federation provides scholarships to Evansville residents with GPAs of 3.0 or higher who plan to study advertising, marketing, graphic design, or public relations. $1,500; AQHA's regional scholarships provide funding to students who serve as youth affiliate ambassadors and plan to complete their undergraduate degrees in Indiana. $1,000; HLC awards these funds to high school seniors within Indiana who plan to pursue a postsecondary agriculture degree. Award varies; Indiana University grants this award to one graduate musicology student and one undergraduate honors student each year. Award varies; Provided through the Indiana Department of Education, this award assists Indiana residents planning to enroll in an associate or bachelor's program on a full-time basis. $1,000; ISAS offers Indiana students assistance with educational costs, provided they plan to work in law enforcement upon graduation. Award varies; INCPA provides funds to students originating from Indiana who plan to become CPAs within the state. $1,000; This award provides funding to Indiana-based engineering students at public or private schools. Award varies; The State of Indiana offers this award to Indiana minority students who plan to work in special education.